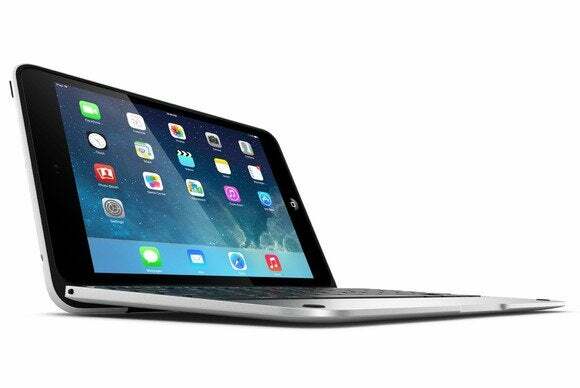 Good news for those of us who use our iPads to create content in addition to consuming it: Case-maker Clamshell has released a version of its popular ClamCase Pro keyboard cover for the iPad mini. The $129 cover is made from a tough polycarbonate shell with an aluminum casing that’s designed to fit perfectly with the smaller iPad’s own design. It incorporates a wireless Bluetooth keyboard that, although not quite full-sized, features large keys built using soft-touch technology. Like the company’s other models, the Clamshell attaches to your iPad mini using a stiff double-sided hinge that allows it to rotate 360 degrees; in practical terms, this means that you can use the cover to set up your tablet in a variety of ways for typing and viewing—in fact, you can also flip it all the way around and essentially end up with a slightly thicker tablet. According to a company press release, the Clamshell’s keyboard lasts for “months” on a charge; once installed, the case doubles the weight of the iPad mini to a total of 1.4 pounds—which sounds like a lot until you consider that it’s a full pound less than the 11-inch MacBook Air. The case, available for sale now on the company’s online store, will start shipping in late January.